A small girl with an injured arm, a woman with a baby and a tearful wife wanting to reunite with her husband are among the thousands who have fled war-torn Ukraine. Now the refugees can only pray for peace and want their families to be with them. “My arm was injured. They have to sew up the wound,” a small girl told RT’s Maria Finoshina, swho was visiting a refugee camp in Russia’s Rostov Region, bordering turbulent Ukraine. The girl was hit in the arm and is now wearing a bandage. Another refugee from Lugansk Region, a young mother, is holding a baby. Her husband was hit when they were trying to escape the shelling. “A shell fragment hit my husband in the back when we were trying to escape artillery fire,” she told RT. A desperate wife who left her husband back in the war-torn country wants strongly to be with him as the war separated them. “I just want the war to end and my husband to be with me. I just want peace,” she said with tears in her eyes. The number of Ukrainian refugees housed in tent camps in Russia is approaching 40,000, a spokesman for the Russian Emergencies Ministry, Aleksandr Dobryshevsky, said Saturday. “As of this morning, there are 39,265 people, including 12,735 children, living in 537 temporary shelters,” he said. According to UN figures, at least 100,000 people have been forcibly displaced after the conflict struck the country. In Ukraine, the town of Pervomaysk, one hotspot in the Lugansk Region, is running out of resources due to heavy shelling. 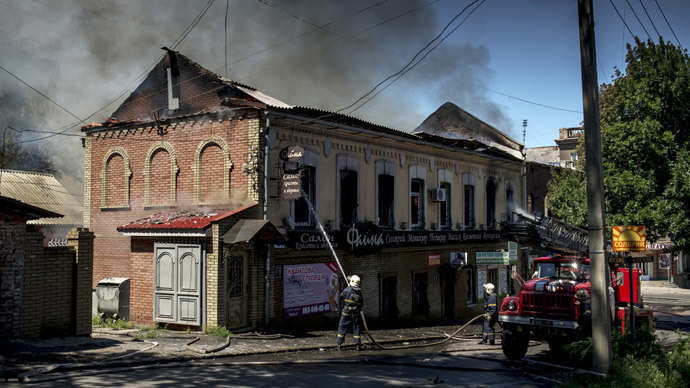 The town mayor, Boris Babiy, says that the whole city is destroyed, apartment buildings and private houses alike. He added that the town, which is home to nearly 40,00 people, is running out of resources. “We've got no transport, fuel or water. We're trying to bring bread into town under fire,” he said. Lugansk city authorities said that in the last 24 hours at least five residents were killed and nine injured, including one child. The recent shelling destroyed a local school, museum and a food market. The city is being plunged into a humanitarian crisis. Gas facilities have been damaged in Lugansk. Electricity has been cut off for several days already, there are also problems with running water while the air temperature reaches 30 C.
“The electricity is cut off in the city… the sirens which inform of the coming planes don’t work. 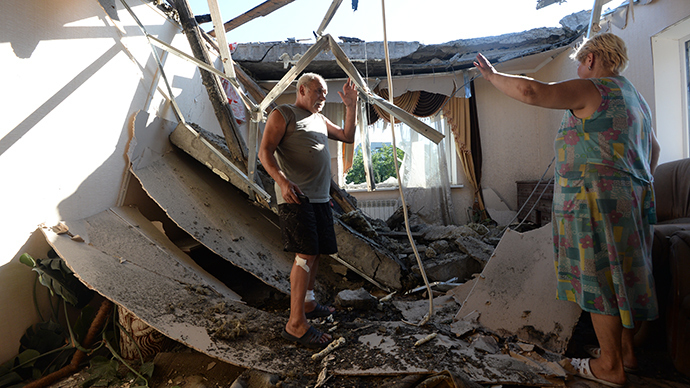 Those who spend their nights in bomb shelters came back to their homes, as there is still moonlight in their apartments,” said the PM of the Lugansk People’s Republic. Lugansk Region, along with the Donetsk Region, has come under artillery fire since Kiev launched a massive “anti-terrorist operation” in the country’s east. In the meantime, the Russian Red Cross has described the situation in Eastern Ukraine as a humanitarian catastrophe and has urged the rapid evacuation of children from the war zone. 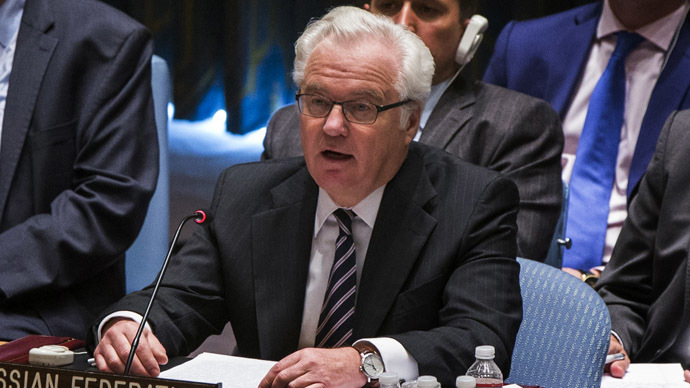 “The situation in Ukraine is atrocious, a humanitarian catastrophe. The children are miserable, people are miserable. Of course, everyone has to be saved. The need for a humanitarian corridor is indisputable. The Red Cross is doing all it can,” said Tatiana Klennitskaya, a spokeswoman for the Russian Red Cross.